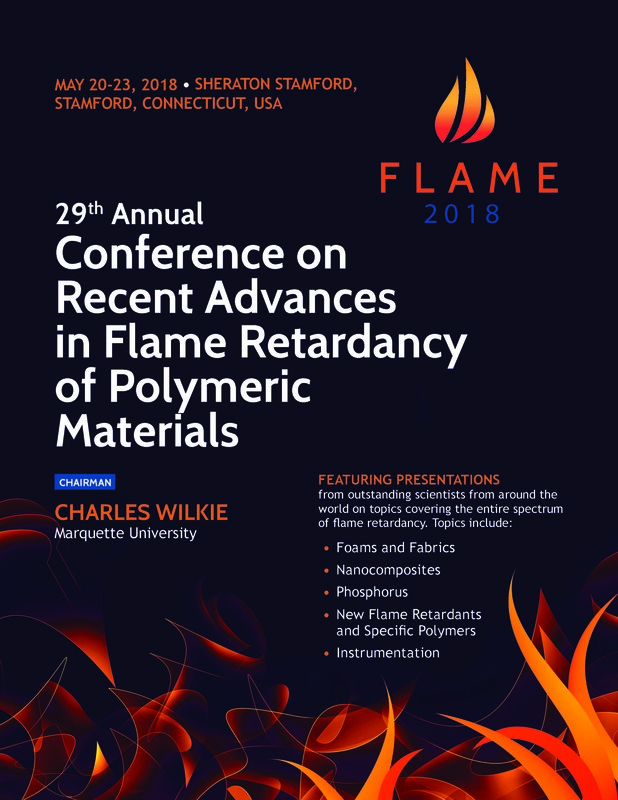 The conference papers are on foams and fabrics, nanocomposites, phosphorus, and new developments in flame retardants, especially polymers and instrumentation. A highlight of the main conference is a series of about 12 talks on fabrics, foams and textiles. One talk, “The Development of Multifunctional Flame Retardant Nylon 6 and Nylon 66 Fibers and Yarns” has piqued both Kelvin and Chairman Chuck Wilkie’s interests and will certainly be of interest for anyone who wants to learn how a Chinese company successfully developed a process to flame retard nylon 6 and nylon 66 fabrics. On the academic side, the conference hosts a student-led “Poster Session.” On Monday, May 21, students from universities around the world, including the U.S., France, Germany and China, will present their research – displayed on posters – to conference attendees. Topics covered in the poster session are as varied as the main conference presentation, and this section provides a look at how scientific research and academic institutions are interacting within the industry. “We often wonder who will take over the field of flame retardancy after we’re gone, and of course, it will be these students,” said Chairman Wilkie. The conference also features a one-day intensive short course, “Selection, Evaluation and Commercial Applications of Flame Retardant Polymers.” Held before the main conference begins, the course is designed for technical specialists new to this industry and is a valuable primer prior to attending at the main conference. The course consists of three interactive lectures by prominent industrial scientists: Matthew Blais, Sergei Levchik and Kelvin Shen. Why should you attend FLAME 2018? Networking! According to Shen, the conference’s broad international scope also makes it an incredible opportunity to network and learn from both the speakers and participants. Returning this year to the Sheraton Conference Center in Stamford, Connecticut the conference includes three days of presentations, which includes the poster session. In addition to the Main Conference, we recommend that anyone new to the industry registers for the Short Course program, which provides key context and background on the conference. The conference includes all meals, breakfast, lunch and dinner, as well as coffee breaks. The 2018 conference is sponsored by Albemarle, Deatak, GBH International and Pinfa. Sponsorships are still available. Visit our Sponsorship Page to find the complete list of sponsorship packages.